This form is to be completed and submitted by the convener (organizer), who can be either a member or a nonmember. Once the form has been received by the Membership Chair, a mentor will be assigned if necessary. The Order of the Daughters of the Holy Cross requires its members to affirm and adhere to the Faith Statement of The Order. This can be found on the home page. Before submitting this form, it would be best to determine if the potential candidates and your clergy will be able to sign the membership application form that requires individual compliance with the Faith statement. Once the Intent for Candidate Training form is completed, send it to the address at the bottom of the form. Once the three-month study to become a Daughter has been completed, download and submit the Application for Membership form. When you fill out this form, you will be asked to choose the size of cross you want sent to you. 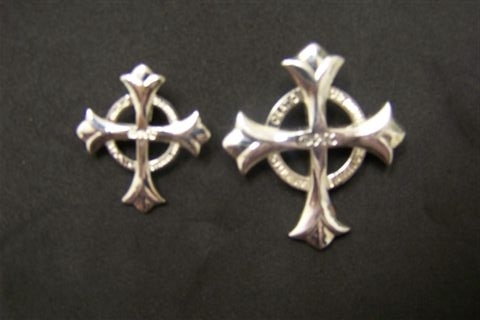 The larger cross is 1.5 inches tall and 1.25 inches across. To see a picture of the size of the crosses in relation to each other click: picture of the two crosses.